A thick water-soluble liquid that occurs naturally in sour milk. Lactic acid is also found in fermented molasses, apples, tomato juice, beer, and wine. It is formed by the action of Bacillus acidilacti on glucose, sucrose, and lactose. Lactic acid is used in dyeing vats as a mordant for wools and as a solvent for water-insoluble dyes. It is also used in leather processing. Soluble in water, ethanol, glycerol, furfural. Slightly soluble in ether. Insoluble in chloroform, petroleum ether and carbon disulfide. 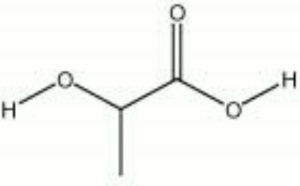 Medium strength acid. Contact may cause redness or burns. This page was last edited on 1 May 2016, at 07:09.